His spirit brilliantly longed for a foreign land. This Saint was by birth an Alexandrian, who was arrested by the governor of Alexandria, and suspended by him and lacerated. He was then put in a lit furnace, by which he delivered his soul into the hands of God, from whom he received the unfading crown of martyrdom. His holy relic was found in the midst of the furnace unharmed and sound, without being harmed by the fire, not even a hair on his head. 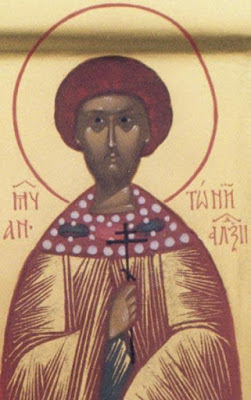 * In the Synaxarion of Constantinople he is called Antoninus, while in the Menaion he is called Anthony.